Vodafone Fijian 7s rep Apisai Domolailai, yesterday made a vow that many men would not give on their wedding day. 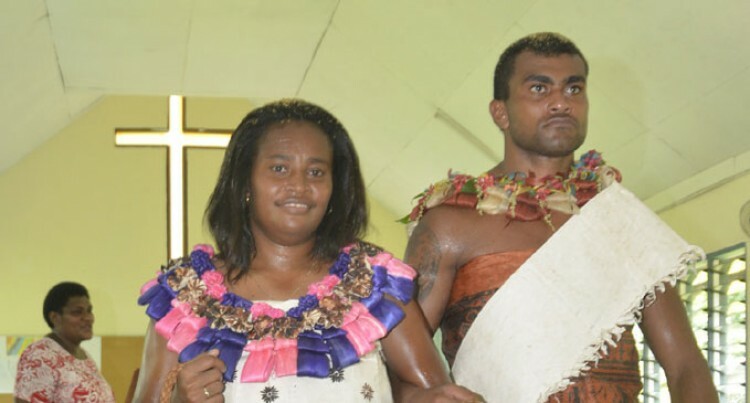 Apart from exchanging vows with his wife Kinisimere Batibasaga during their wedding at Tagaqe Village in Nadroga yesterday, the lanky forward promised that he would work hard to play in Hong Kong 7s. “I want to play in HK, but it won’t be easy. Hard work is needed and I am giving my best shot there,” he said while escorting his wife out of the village church after their matrimonial service. Celebrations were limited to the weekend for the couple as Domolailai resumes training tomorrow to regain his position in coach Ben Ryan’s HK list. The Laselase native who will celebrate his 27th birthday on April 16, made his debut in the 2012 season of the World Rugby Series (formerly known as IRB Sevens Series). He said getting married was a blessing. The couple had been courting since 2012. Batibasaga, 29, promised she would support her husband in rugby. “A good marriage made its foundation in Jesus Christ in order to experience lasting love, peace and joy,” she said. She said Domolailai did not lose hope after he was dropped last year after the Dubai and South Africa 7s. The couple met when Domolailai started working at the Fiji Hideaway Resort and Spa.